By Travis - Brazil - 03 Aug/03 - Viewed 1584 times. There isn't much to add to the photos of our visit to Igua�u Falls. We had a 17 hour bus ride to get there, stayed in a pretty basic hotel, got a headache trying to navigate the local buses to the falls on the Brazilian side and on the Argentine side, and left a day and a half after we had arrived for a 20 hour bus ride to Ubatuba, Brazil. The ho-hum logistics aside, we were both amazed by the falls themselves and loved our time there. 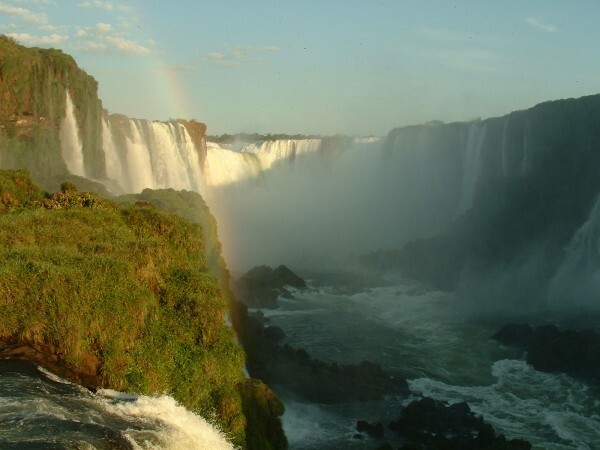 The Rio Igua�u (establishing the Brazilian/Argentinian boarder in this area) plunges 80 meters at 275 different falls, some of them single drops and others in multiple tiers. It probably ties the Perito Moreno Glacier in Argentina for the most incredible natural wonder that we've seen in South America.